On a recent Oprah Winfrey show, she talked about a fudge bar that was fat free and sugar free, and only about 40 or 45 calories. She would not give out the company name on the air. Any idea on what brand it could be? I've gotten a lot of email about those bars. And since those emails started coming in, I have been searching high and low for the answer. From watching the show, I know they're supposedly sugar free and fat free. And they come in a white wrapper with two pops attached. After doing extensive research (i.e. : calling everyone I know, scouring every supermarket known to man, and googling every frozen fudge bar under the sun), I have come to a conclusion. 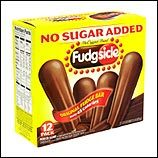 The pops that were featured are Popsicle brand's No Sugar Added Fudgesicles. They are not completely fat free (they are almost fat free), and they have 40 calories each, but based on the way they look, and on all of my research, these must be the pops that were featured on the show. In any event, these bars are delicious and chocolatey and very low cal. I'm also a huge fan of Healthy Choice's Premium Fudge Bars (80 cal. 1g fat and they are HUGE) and Smart Ones Giant Fudge Bars (80 cal., 1g fat). You really can't go wrong with any of these. Pssst...the 80 calorie bars are much larger than the 40 calorie ones. Are there any good websites for teaching my 9 year old daughter about healthy eating choices, portion control, and fitness? I don't always want to be the bad guy when it comes to eating too much! BAM! Fit4Life - This site has easy recipes, quizzes to find out what activities best fit different personalities, interviews with famous young athletes, tips for packing healthy lunches and more. Let's Just Play - Even Nickelodeon is getting in on the "healthy kids" action. Their "Let's Just Play" initiative encourages kids to get off the couch and get movin'! Nutrition Explorations - Features contests, fun games, recipes and more. It's brightly colored and easy to use, too. Smart Mouth - This site is packed with recipes, facts, videos, articles -- all brought to us by our friends, the "Food Police" at CSPI (Center for Science in the Public Interest). Hope you find these sites helpful! Today, June 8th, is National Gingerbread Day. This is the perfect day to splurge with a high fiber, low cal Rising Dough Ginger Spice cookie. Have a question for Hungry Girl? Send it in! She answers two new questions every week! Remember, between now and July 15th you should be telling everyone you know about Hungry Girl. The person who gets the most pals to sign up for our free daily emails wins an iPod Shuffle. So click "send to a friend" NOW!